One entire chapter in my memoir “Greenwich Meridian” is dedicated to me living and working in Lowell. It is called Emma Palova, the journalist, because my daughter is also Emma Palova. “It’s a long story,” I answer as we sit down and talk. That afternoon, long time ago, we drove down Main Street. I immediately fell in love with the charming town. 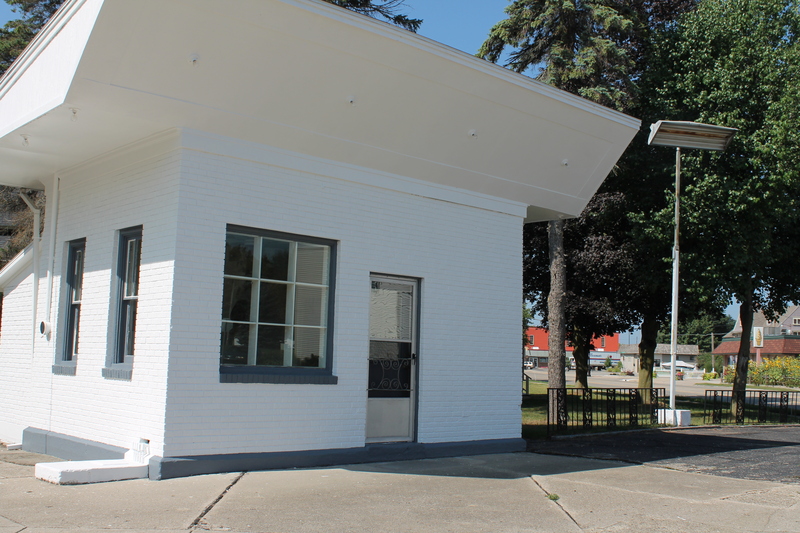 There was no Riverwalk yet, and the Lowell chamber office was located in the tiny white building on the east end of town. I remember talking to director Liz about basic information on the town. A colorful block on Main Street Lowell. We walked into Reedy Realty looking for land or a house. 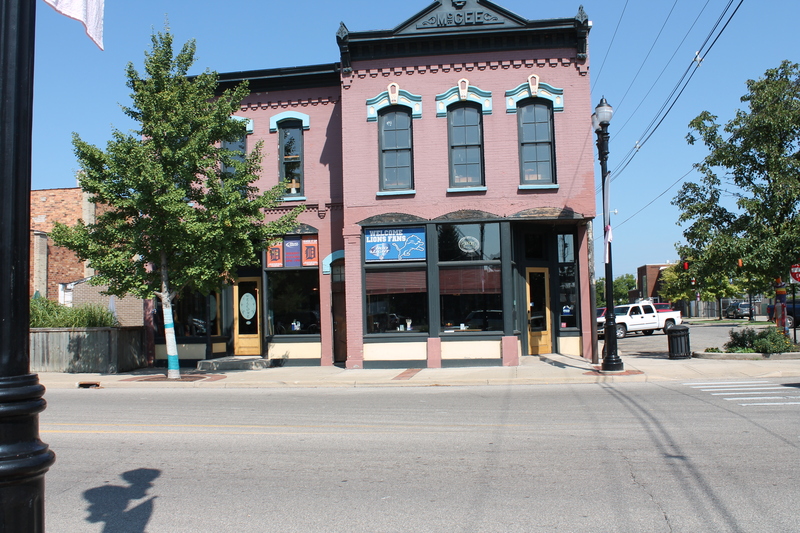 The Flat River Antique Mall still existed with its soda fountain, and instead of Flat River Grill there was the Swan Café. I think Flat River Cottage was located inside what is today Main Street Inn. I liked everything about the town including Springrove Variety and Larkin’s had their saloon door, way before the modern street façade. There was a Spartan grocery store Family Fare just big enough not to get lost in it. We found land in Vergennes Township and built a house not far from the Franciscan Sisters. I think at the time the railroad track was to a certain point functional. My son Jakub Pala went through the Lowell Area Schools system from Cherry Creek Elementary third grade to Lowell High School. He played soccer under coach Pala. Lowell is home to a strong arts organization Lowell Arts! Artsy knits wrap around trees. When my mother Ella first visited with us, she said Lowell looked like a “cowboy village” recalling her first years in the country in Hawkins, Texas in the seventies. “This looks like Hawkins,” she said. I liked the quaint atmosphere of the Lowell area mainly the Fallasburg Park with the Covered Bridge and the historic pioneer village. I visited the one-room school-house many times, most recently right before my trip to Europe. My love for history led me to explore many area historical sites and museums. Compared to Europe, the museums and history here in North America are young. One of the oldest bridges in Prague made of stone, the Judita bridge, dates back to the sixth century. I’ve seen and written about all the special exhibits at the Lowell Area Historical Museum including the most recent and my favorite one, “Real to Reel.” The town has a strong Lowell Arts! Organization that puts on many exhibits, concerts, and theatre plays by Thebes Players. Riverwalk with Showboat with pedestrian area on the banks of the Flat River. Summer concerts are held here. The Englehardt Library was constructed with monies from the Englehardt Foundation. Overall Lowell has been fortunate to have many philanthropists and community foundations that enable community projects such as farmland preservation. 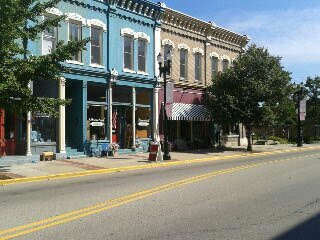 I love the architecture of Main Street, its buildings with front and back door entrances. That differs a lot from European towns and villages. Most European towns and cities have squares with fountains or monuments in the middle. The buildings usually have one front entrance only. However, there are some similarities such as many towns and cities in Czech Republic also sit on the banks of rivers. They do have promenades like Lowell has the Riverwalk. Prague even has several botels on the Moldau River, which are floating hotels on boats, but they don’t have a Showboat. Old Lowell Area Chamber of Commerce office on the east end of town. Today, as I took photos for my EW Emma’s Writings online journal blog to show my friends in Czech Republic how we live, I realized how fortunate we are. 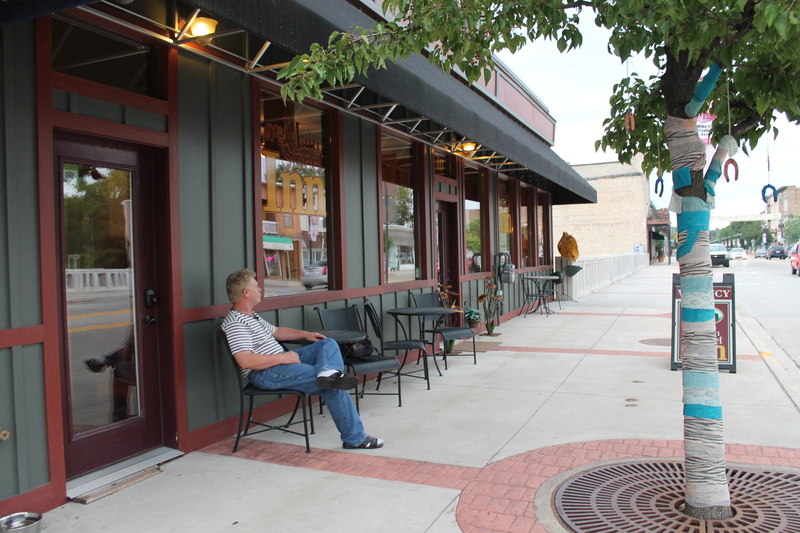 From the artsy knit work on the trees in downtown to the Pink Arrow Pride t-shirts, the town has a lot to offer. We patronize all the businesses in Lowell. My future daughter-in-law Maranda will have a baby shower at the beautifully renovated Main Street Inn. Larkin’s pub on Main Street in Lowell. Each year in September, the town decks its lampposts with posters and pink shirts commemorating cancer victims. The Pink Arrow Pride project in its sixth year raises money and forces against cancer. For the annual football game that takes place at the Red Arrow Stadium both the players and spectators dress in pink. This year the game will be held on Sept. 6. It is the hottest game of the season. Lowell is surrounded by two townships, Lowell Township and Vergennes Township. The high school along with the stadium is located in Vergennes Township. Other area attractions include a charming bed & breakfast Witt’s Inn in Vergennes Township completely remodeled with a wedding barn. It is nestled among apple orchards. 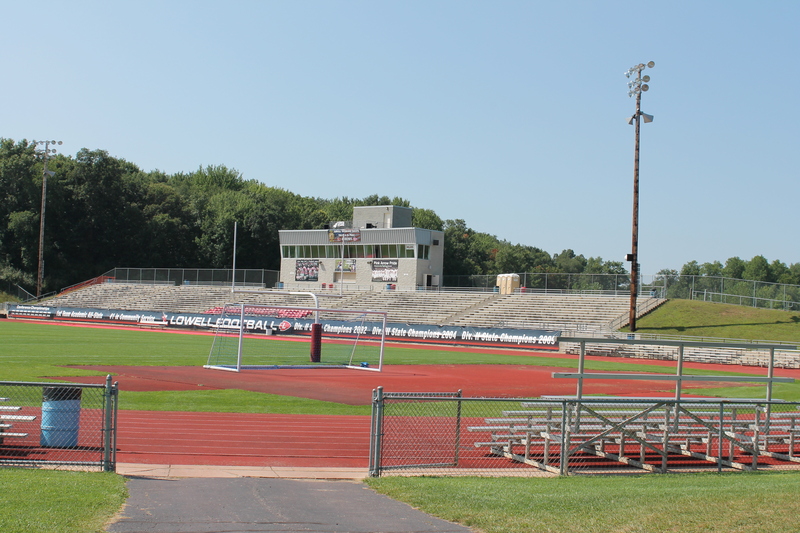 Red Arrow Stadium at the Lowell High School annually hosts the Pink Arrow Pride. 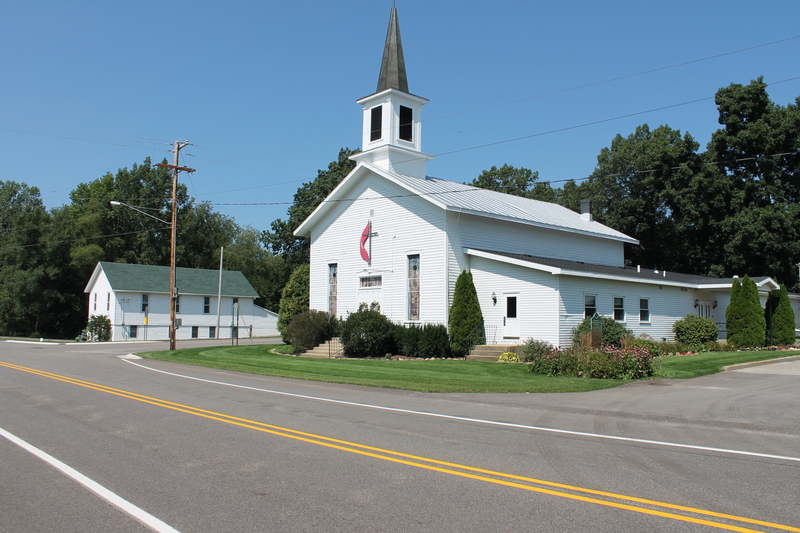 Among the many interesting churches in the area is the Vergennes United Methodist Church constructed in 1864. It is a simple clapboard structure reminiscent of buildings on the East Coast. The Franciscan Life Process Center holds their annual Harpfest in mid August. The center has many arts and music programs. And then of course, there are the trail systems and Lowell is at their crossroads. I can’t wait to hit the Frederick Meijer Flat River Trail from our place to town or to Belding. The trails have been in the making for the last six to 10 years due to hard work of many involved volunteers. So, as the years roll by, I learn to appreciate more and more the rural area we live in with all that it has to offer. American Midwest has its own magic with the changing seasons, and the changing colors. When I first found out that people do color tours here, I could not believe it. Now, I understand the beauty of the American fall. Vergennes United Methodist Church and Vergennes Township hall. Vergennes & Lowell townships surround the city of Lowell. Precincts 1&2 vote at the township hall and at the Methodist Church. The Main Street Inn is the only hotel in Lowell with seven rooms and large meeting spaces. It has been totally remodeled in the space where a hotel used to stand. Main Street Inn in downtown Lowell overlooking the Flat River.